Wednesday October 12th 1492 was no ordinary day, for on this day Christopher Columbus reached the New World. On that day, after sailing across the Atlantic Ocean, the Italian explorer sighted a Bahamian island, believing he had reached East Asia. His expedition went ashore that same day and claimed the land for Isabella and Ferdinand of Spain, who had sponsored his attempt to find a western ocean route to China, India, and the fabled gold and spice islands of Asia. How did the Ancient Greeks know the Earth was round? It’s still possible to find history books which blithely talk of how Columbus first showed that the Earth was round but as early as the 4th century BC, Aristotle was declaring that “The sphericity of the Earth is proved by the evidence of our senses. He put forward several different ways of showing that we live on a giant ball. For example, explorers reported new patterns of stars corning into view in the night sky and familiar ones vanishing over the horizon as they travelled further from home, no matter which way they went. Even more tellingly, as a ship approached its home port, those waiting for it would not see just a tiny ship in the distance getting ever larger but would first see the tip of its mast and then ever more of its hull – just as if it were sailing over the crest of a globe. A century later, Eratosthenes succeeded in measuring the circumference of the Earth. By observing the length of the sun’s shadow from two different cities on the same day of the year, he found a figure of around 28,500 miles – within 15% of the true value of 25,000 miles. 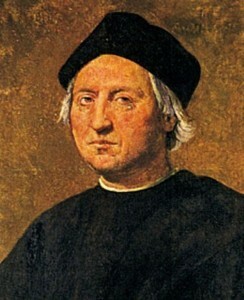 Columbus, in contrast based his expedition plans on the far smaller figure of 18,500 miles -probably as a ruse to increase his chances of sponsorship. On August 3, 1492, Columbus set sail from Palos, Spain, with three small ships, the Santa Maria, the Pinta, and the Nina. On October 12, the expedition reached land, probably Watling Island in the Bahamas. Later that month, Columbus sighted Cuba, which he thought was mainland China, and in December the expedition landed on Hispaniola, which Columbus thought might be Japan. He established a small colony there with 39 of his men. The explorer returned to Spain with gold, spices, and “Indian” captives in March 1493 and was received with the highest honours by the Spanish court. He was the first European to explore the Americas since the Vikings set up colonies in Greenland and Newfoundland in the 10th century. He was the first European to explore the Americas since the Vikings set up colonies in Greenland and Newfoundland in the 10th century.